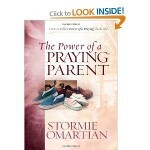 This morning, I finished reading “The Power of a Praying Parent” by Stormie Omartian. I’ve been slowly reading it (and utilizing the prayers in it) for a couple of weeks. It’s really a phenomenal book to have on hand. Of course, I constantly pray for my son, but my prayers are so often limited to the “here and now” – prayers for guidance on the right preschool, prayers in how to handle temper tantrums and discipline, etc. Until reading this book, I never really prayed for things he “may” face in the future (with the exception of prayers for his salvation) – i.e. identifying God-given gifts and talents, attracting godly friends and role models, avoiding addictive behavior (alcohol, drugs, etc), rejecting sexual immorality, etc. I’ve read this book too and it is wonderful! Love following your posts on “Shepherd my child”….. Thank you so much, Mrs. Marty! I am grateful to have you following along!